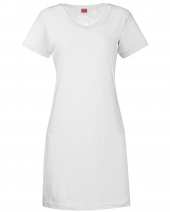 Buy Ladies Dress on Discount Price - Ustrade Ent. Fashion trends are always start with women. We always search the ways of acquiring those women dresses which are of high quality, unique colors and coll design. We love to offer women dresses so they feel themselves accomplished yet fashionable. 30 singles. Cinched waistband. Drop tail hem. Sideseamed. Easy, drapey fit. 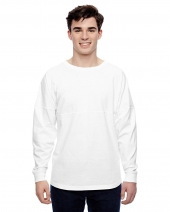 • 65% polyester & 3..
Garment enzyme-washed. Oversized cut. Front and back yoke. Rounded bottom waist hem. Charcoal Heather is 60% cotton, 40% polyester. Oxford is 92%..
Topstitched, ribbed crossover v-neck collar. Taped neck. Easy Tear Label. Double-needle hem sleeves and bottom. White is sewn with 100% cotton th..
4.5 oz., 100% combed ringspun cotton; White is sewn with 100% cotton thread; Heather is 93/7 combed ringspun cotton/polyester jersey; Easytear? labe..
4.9 oz., 50% polyester, 38% cotton, 12% rayon triblend jersey; 50% polyester, 38% cotton, 12% rayon triblend jersey; Sideseamed for a better fit; Ma..